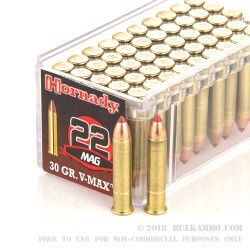 Perhaps one of the most finely engineered .22 rounds on the market today, the Hornady 30gr .22 Winchester magnum rifle V-Max truly belongs in a class all its own. 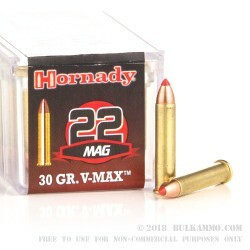 The Hornady 30gr .22 Winchester Magnum Rifle V-Max is one of the only .22 caliber bullets on the market to feature Hornday’s Heat Shield rated polymer tip technology. This tip is the secret to Hornady’s unparalleled terminal performance. The polymer fills the internal cavity of the bullet, and upon impact drives polymer nose cone into the very core of the round. This results in a truly explosive level of bullet expansion, even a lower terminal velocity. 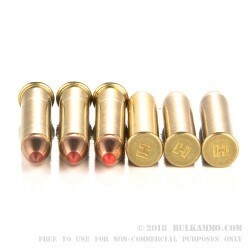 A swagged lead core allows a precise formation of the bullets core, resulting in a round that is perfectly balanced across the entire shank of the round. The boat tail recess at the bullets shaft serve to stabilize the bullet in flight, and at a muzzlevelcoity of 2,200 feet per second, these are the hardest hitting .22 caliber rounds in existence today. If you are in need of a .22 caliber round that can deliver performance uncharacteristic of its size, the Hornady 30gr .22 long rifle V-Max is ready to answer the call.